I was away for a couple of weeks and even with the help of a super house/garden sitter – the weeds had taken a hold over some of the beds! It took me all last week (and a lot of sweat) to get it under control, but now I’m back on schedule – I have started to implement the fall/winter vegetable plan. I sowed some brassicae in the cold frame (and covered it with burlap for shade). I need to dig up some potatoes to make room for the transplants in three weeks or so. 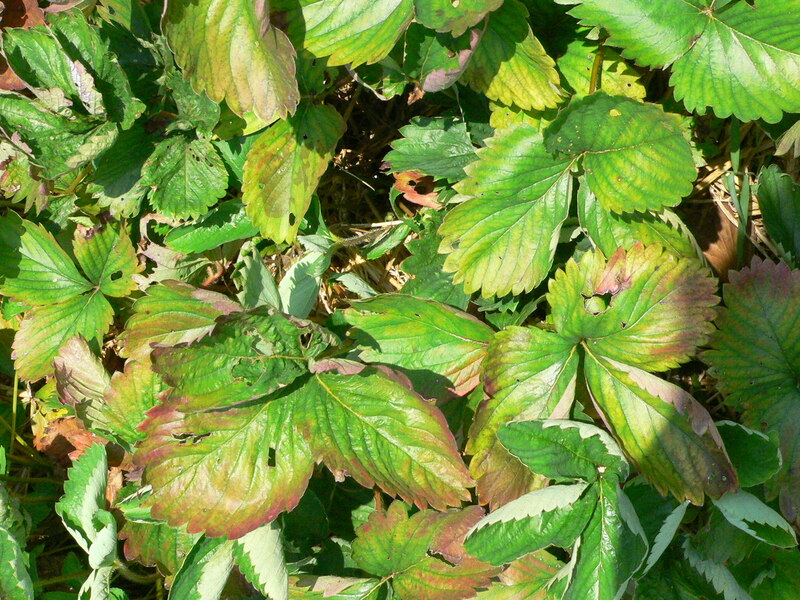 After doing the Weed Management part of the County Extension’s course in Organic Vegetable Production, I know that I should prepare the beds two weeks in advance, then slice off any pesky weeds that sprout just before I transplant or sow more seeds. I emptied a small bed of strawberries since they didn’t produce very well and were infected with a fungal disease – I am going to use it for carrots. My best carrot crop ever was from the cold frame this year, sown in February and picked in June – the rest of my attempts this season have proved fruitless (or carrotless), however I am determined to work out the best way to grow them in the main garden, and I want to try them after the frost – they are supposed to be really sweet then. Here is my plan – I will build up the sides of this small square bed and fill it with composted leaves and bought compost. Then sow the carrots and leave them under a board or burlap for a couple of weeks – then flame weed the bed just before the carrot seedlings come up… we’ll see! On the harvesting front – we have enjoyed an abundance of blueberries – so juicy and nice, raspberries (don’t know if they are good, since I don’t eat them) and green beans have been particularly good – I read in the Victory Garden cookbook that after steaming, you should dry them out in a dry saucepan before adding butter or whatever else – it works! They are delicious! I’m a bit worried about the tomatoes – they look OK but they do have signs of some disease at the bottom – unfortunately due to a bad reaction to a wasp sting, I wasn’t able to attend the Disease Management part of the Organic Vegetable Production course, so I’m not sure what it is – I’m hoping it is not Early or Late Blight. What I did learn from reading the literature though was that once a plant shows signs of disease, it is generally too late to do anything about it by spraying, so I have been removing infected leaves (in dry weather) and putting them under plastic to kill them (spores cannot live on dead plant tissue). My Early Girl tomatoes are not living up to their “before July 4th” expectation – still green.. I guess you have to have a greenhouse to get them that early. The trellising technique seems to keeping the growth of the tomatoes under control, the real test is when the plants are full of fruit and it rains like crazy – then we’ll see if they are still standing (unlike the cages that normally fall down). 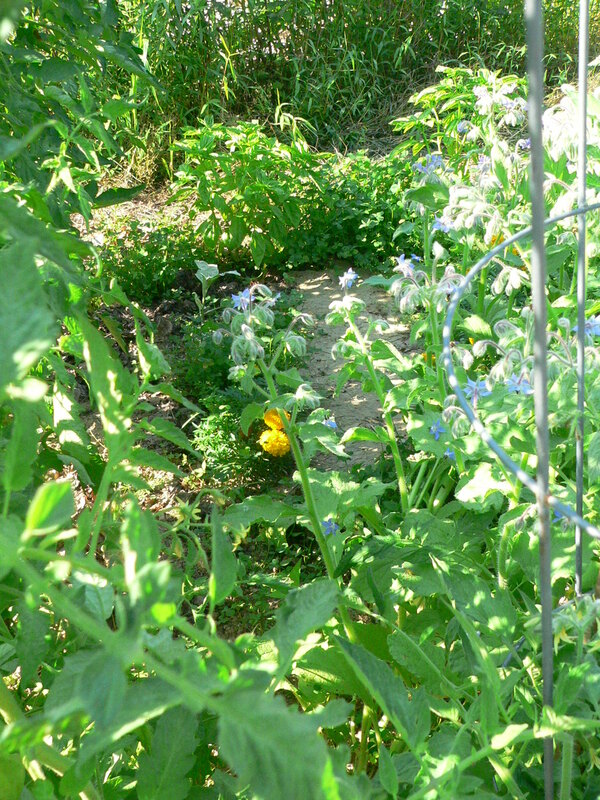 I’m very happy with all my companion planting – the borage, marigolds, catnip, alyssum and many others are all attracting the good bugs – I haven’t seen that many “bad bugs” so far. An interesting development, whilst I was away, the radishes I planted around the squash and the cucumber went to flower and the honey bees love them! I have left them in place, they even have seed pods on them, so I might save the seed (have to check they are not hybrids first). What a wet week! 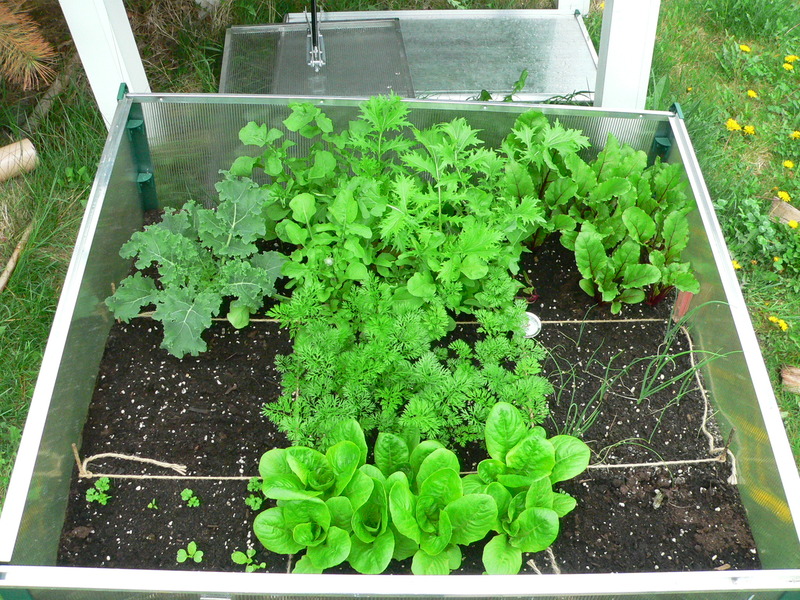 I have been trying to protect my seedlings and the plants in the cold frame by covering them during the downpours, and quickly uncovering them when the it stops in a vain attempt to get them to dry out a bit. Can’t do anything about plants in the ground though – actually, if nothing rots, the rain seems to have brought on the potatoes, onions and beans pretty well (same applies to the weeds of course!). I did manage to get out into the garden yesterday morning – I fulfilled my personal mission of converting some of my sons’ old trampoline into a low tunnel to protect the sweet potatoes from unwanted invaders. It looks a little strange, but that’s OK – it all adds to the uniqueness of Winifreds Little Acre! I also edged around the raspberry fence that is hopefully going to protect the other crops outside the deer fence – I had a problem with escaping raspberries into my blueberries this year, so I decided to pre-empt the problem in this new raspberry patch. The bees haven’t had too much chance to fly due to the rain, but hopefully they are still busy sorting out their new home. I’m a little worried about the baby peaches with their soft fuzzy skin – all this rain might take a toll. I’m planning to give them another holistic spray this weekend to help them out. I have my curcubits – summer squash, cucumber (2nd sowing – first one failed) and melons in the basement germinating as I write hopefully. They should be ready to go out in a couple of weeks – they normally grow pretty fast. I’m looking into how to protect them from the cucumber beetle – they were all badly affected last year by bacterial wilt – so far my plan is to plant a ring of radish before I transplant them and then to cover them as soon as I put them out. 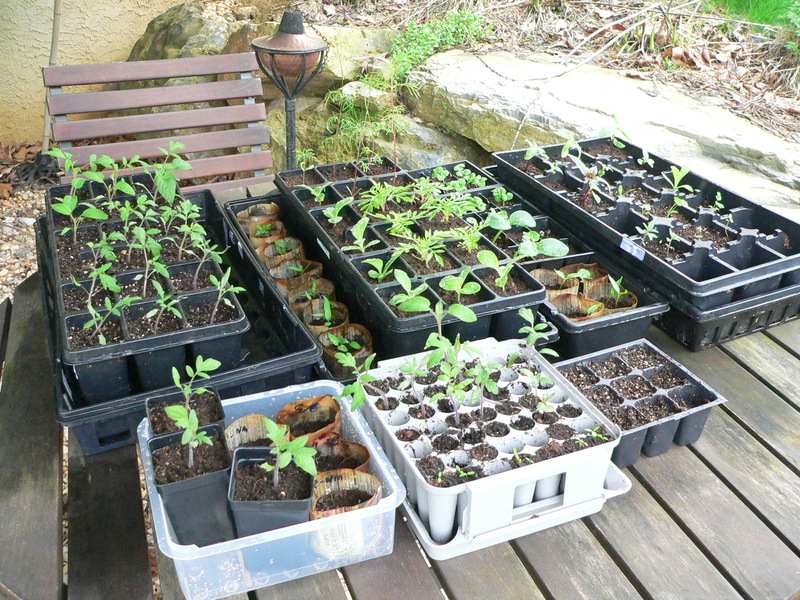 Looking forward to a great transplanting weekend – my babies are all ready to go out into the real world! It’s getting busy in the garden now! My parents arrived from the UK last week and I been keeping them busy digging new beds and tidying up the perennial beds out front. I have been busy repotting some of the seedlings – even though it has turned warm all of a sudden, I am not planning to put out the tomatoes, peppers etc. for another couple of weeks at least, so they needed a new temporary home. I harvested the bottom box of the vermicompost (worm), mixed it with 1/3 part coir and 1/3 part vermiculite for the potting mixture – it seem ed to be a little lacking in substance compared to the commercial mix I had been using but at least it was homemade (aka cheaper) and the seedlings will tell me if its good or not. They have been enjoying the warm weather in the last couple of days (and I have been saving electricity), by putting them outside in the daytime to see the real sun instead of pretend fluorescent lamps! I sprayed the apple & cherry trees and the grape vine yesterday with the homemade spray – molasses, vinegar, fish and seaweed. 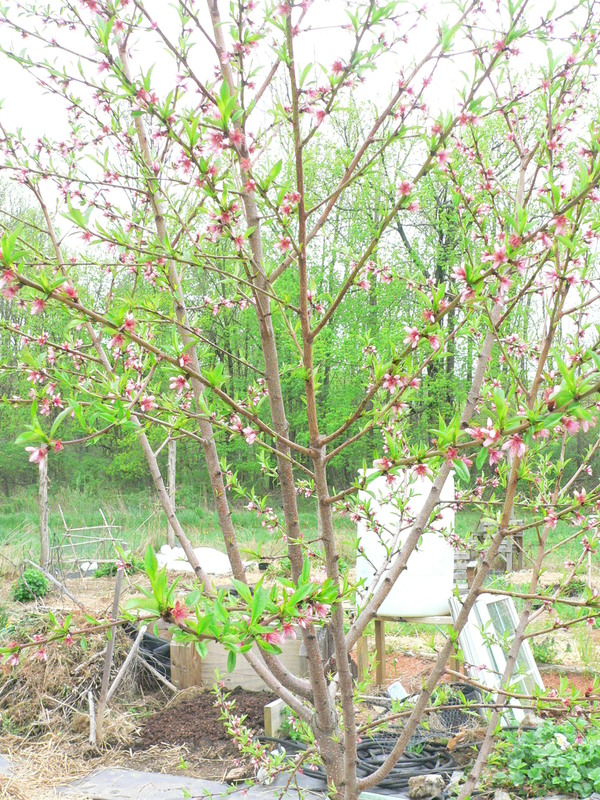 I couldn’t do the peach since it is in full bloom right now – how pretty it is! I do have some blooms on the cherry tree, but not much coverage. I did purchase some Neem oil to add to the mixture but it was solid, so I have to take it back. On the harvesting front – we have been enjoying the asparagus – super tasty. I read in the Victory Garden cookbook, that you can peel asparagus so that the lower less tender portion is more palatable – that worked great! We had friends over for Easter lunch and we had plenty for a small appetizer. We finished the first radish crop and have been taking the odd lettuce leaf from the cold frame for our lunches. The lettuce seedlings I transplanted into the garden are much less happy than the ones in the cold frame, I think it got a bit too cold on a couple of nights and also the soil is much less rich – it was a bit of a shock to them – hopefully they will buck up and start growing soon.. I also transplanted six broccoli seedlings from the cold frame – I have them under fabric to protect them from the dreaded cabbage worm that ate them all last year. Hurray, the peas are coming up! Despite all this cold and rainy weather (and my impatience)! The carrots also germinated under the board I had over them to stop the seeds getting washed away – but now I am worried about the effect the rain is having on them – they were a little spindly since they took me by surprise and germinated quicker than expected. Time will tell if they make it – if they can get through today, they should be OK since we have a little break from the wet coming up tomorrow. The seedlings in the basement are doing well – even my basil has germinated, usually I have difficulty with basil for some reason, but all the new seeds are coming up, the seed from last year is being a bit more temperamental – maybe basil seed doesn’t keep well – I’ll have to look that up. I’m a bit afraid the lights aren’t bright enough, since there doesn’t seem to be a lot of growth from the plants once they get their first leaves. Mike McGrath says you should change out the lamps every year, but I was trying to save the planet (and the dollars) by not doing that. I heard on his show this week that the LED grow lights are pretty effective – I will look into those – good from an energy efficiency standpoint, probably not too easy on the pocket though. 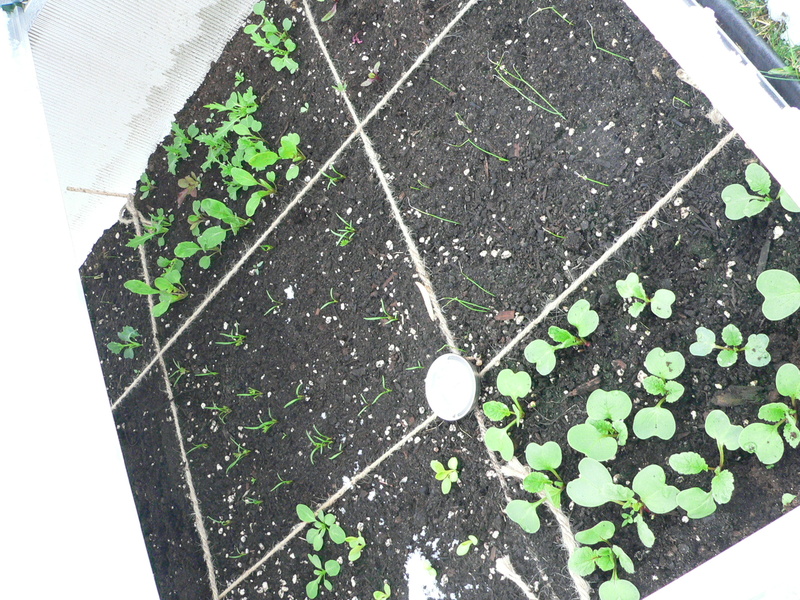 I’m pleased with the transplanted lettuce and kale – all doing well in the garden, and the mache and other radish that I sowed last week is coming up too. The garlic plants are going crazy – I sprayed them with some fish fertilizer a couple of weeks ago, I may do that again soon since I can’t quite be bothered put compost around each one of the plants. 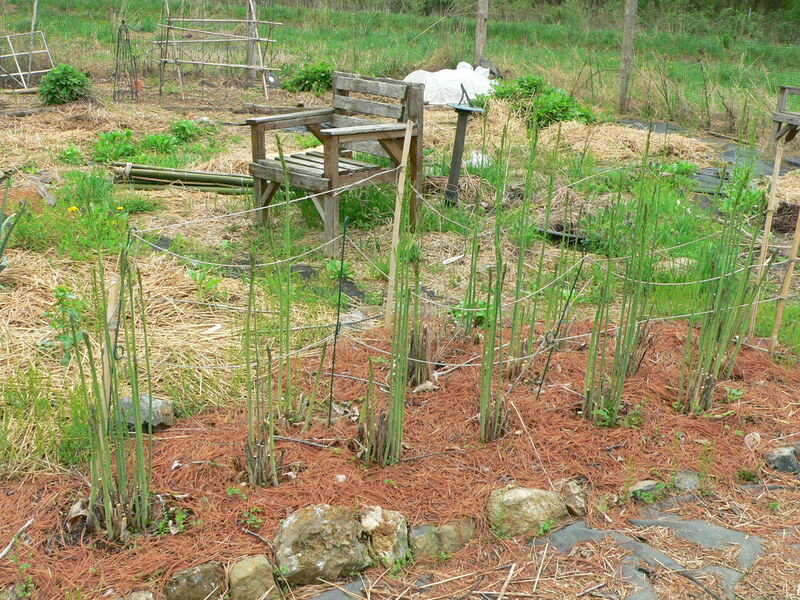 Can’t wait to harvest the first asparagus – it is starting to shoot upwards now – I have to check my reference books to see what is the best way to harvest (first time for me) and how long to keep cutting, etc. There is life in those sweet potatoes after all! 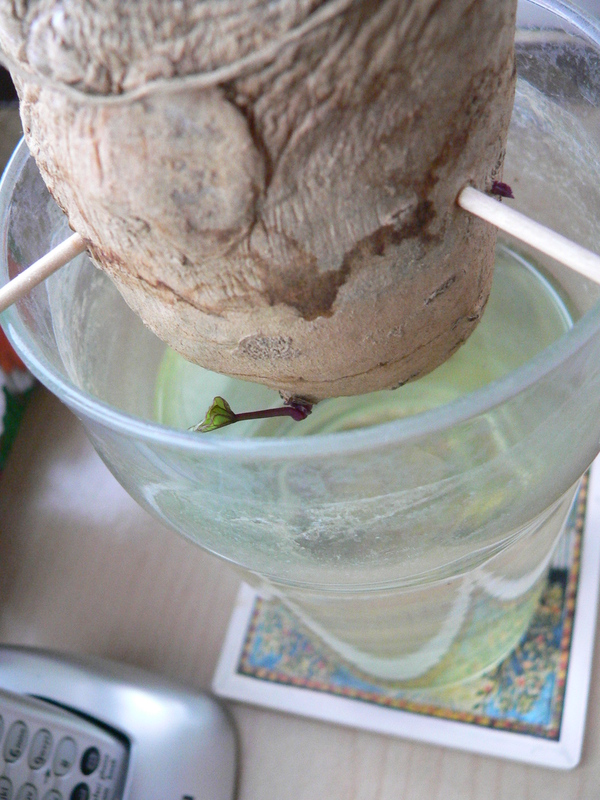 I had given up all hope on the moldy shrivelled sweet potatoes that I have had in water for the past two months hoping for them to sprout leaves and save me a few bucks on slips – but today I looked closely and to my surprise – there were some little shoots coming out of the sides of the potatoes!! One even has a little leaf on it.. just goes to show that patience is definitely a virtue in the gardening world..
Not much going on in the garden still – been a bit cold and rainy. I have been opening up the cold frame to harden off some of the seedlings that I will transplant into the main garden soon. Also keeping a close eye on all the seedlings growing under lights in the basement. The newspaper pots dry out really quickly, so I have to water them once and sometimes twice a day. I did have had to do some thinning of seedlings – I always feel like the mother in Sophie’s Choice when it comes to that job – choosing between one seedling and another – which one is best? 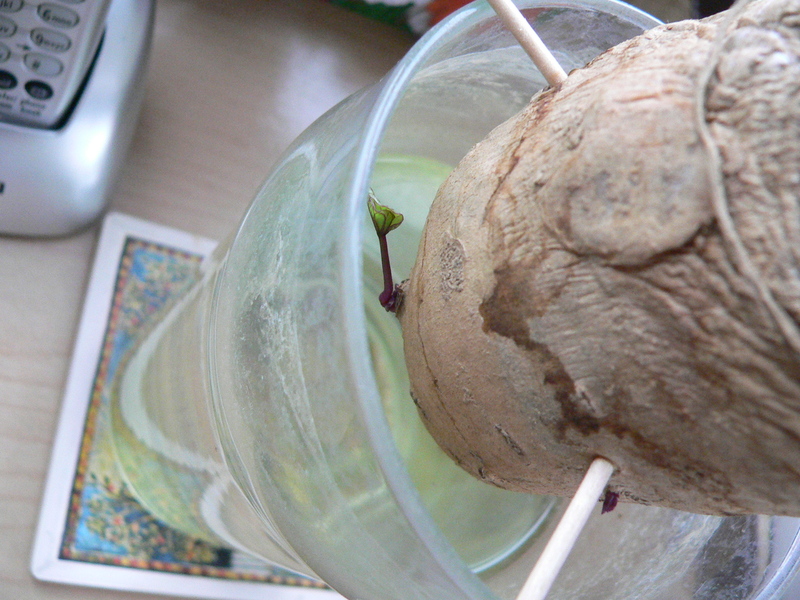 I usually clip the unlucky one off with some nail scissors so as not to disturb the roots. OK, so now I’m getting a little frustrated by the weather.. I had been wanting to get out and sow some cold weather plants this week (and last week) – but it has been so cold that I thought it may be a little premature for them to be able to germinate – plus it is going to snow again this weekend! Arrrgh! I expect soon enough we will be complaining about the warm weather.. I think I’m going to take the extra lettuce seedlings from the cold frame and plant them out in the garden instead of eating them! On the side of progress, I did manage to sow a good variety of seeds indoors last week – the rest of my tomatoes (4 more varieties – I’m trying out a determinate this year – Marinara – as well as the indeterminate heirloom favorites Amish Paste and Brandywine and Peacevine cherry tomato). I also sowed some celery, some companion plants – borage, calendula, four o’ clocks, dwarf sunflowers and some herbs – cilantro and summer savory. I now have two shop lights on and I use christmas lights to provide a little heat to aid germination – seemed to do the trick!